THIS IS THE NEW IMPROVED VERSION. THE BOOK AS BEEN COMPLETELY EDITED AND NOW CONTAINS A HANDY MATH RESOURCE CENTER AND GLOSSARY. ISBN# 978-0999443378. 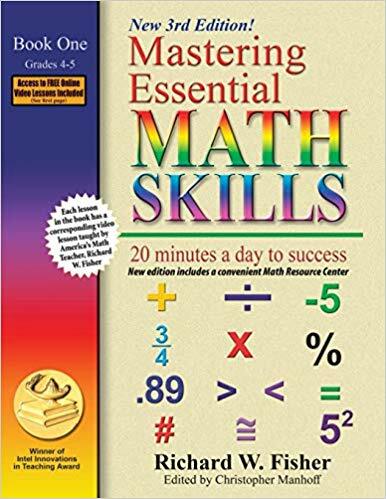 Perfect for students who have struggled with math in the past. INCLUDES AWARD-WINNING ONLINE VIDEO TUTORIALS. ONE FOR EACH LESSON. Review is built into each lesson so that students retain what they have learned. Each lesson includes Problem Solving. This ensure that students will learn to apply their math skills to real-life situations. THIS IS THE NEW IMPROVED VERSION. THE BOOK AS BEEN COMPLETELY EDITED AND NOW CONTAINS A HANDY MATH RESOURCE CENTER AND GLOSSARY. ISBN# 978-0999443378. Used by hundreds of thousands of students each year Perfect for students who have struggled with math in the past. INCLUDES AWARD-WINNING ONLINE VIDEO TUTORIALS. ONE FOR EACH LESSON. Lessons are presented in a format that everyone can understand Each lesson flows smoothly and logically to the next Each lesson is short, concise, and to the point Lots of examples with step-by-step solutions. Each lesson includes valuable Helpful Hints Review is built into each lesson so that students retain what they have learned. Each lesson includes Problem Solving. This ensure that students will learn to apply their math skills to real-life situations.